"I want to make stuffed chicken breasts to have on hand in my freezer. I stuff the raw chicken breast with spinach, sundried tomato and feta cheese. I normally cook right away, but wondering if I could freeze this? I guess I worry about the feta cheese getting contaminated with chicken bacteria during the thawing process!? " make sure it is piping hot which will kill any bacteria, then allow it to cool slightly for eating. This is particularly relevant for casseroles or curries where it's tempting to only heat until it's warmed through. There's a recipe in FROST BITE for stuffed chicken. I don't normally give away too many recipes from the book (the publishers wouldn't be impressed!) but this is such an easy one that it's worth sharing. 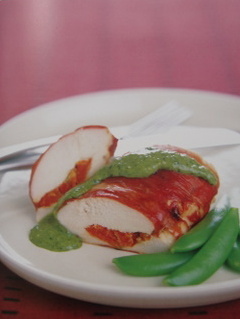 For the chicken: Cut a pocket into the side of each chicken breast and fill with the semi-dried tomatoes. Place two pieces of prosciutto next to each other (long sides together) and roll the chicken down the length of the prosciutto so that it is well wrapped. Place in a plastic container or ziplock bag. For the pesto: follow the instructions here. Freeze: Ensure the chicken is airtight then place in freezer. Freeze the pesto in a small container or ice cube tray. Defrost: Chicken - In the fridge (or partially defrost on the kitchen bench before finishing in the fridge). Not suitable for the microwave. Pesto - on the kitchen bench or in the fridge. Cook: Brush the chicken breasts with a little olive oil then bake in 200C (400F) oven for about 20 mins or until cooked through and the prosciutto is crisp. Timing will depend on the thickness of your chicken breasts. Place the pesto and cream in a small saucepan and stir over medium heat till just simmering. Serve: Slice chicken in half on the diagonal and serve with some sauce spooned over and remaining sauce in a bowl on the table.